I was up and ready to go at 5:00 AM for the trip back over the hill to McCloud. We dropped off the First Section passengers back at their train and our driver took us back to the shops where our Second Section had dropped us off but wasn't there yet. I got off the bus and put down my luggage. The McCloud 18 backed down for the next runby. It would come forward when everyone was ready and in postion. There were very few photopraphers here making some of us think that maybe the people on the First Section didn't know this was taking place this morning. I was glad to be a part of this and it made up for the whole Signal Butte problems on the Second Section yesterday. We all said our goodbyes to the McCloud 18 which put on a fine show and reboarded our Second Section of our Trains Unlimited Special. 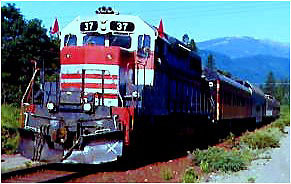 Once we were all onboard, our section left McCloud for a grade crossing in Mount Shasta City. 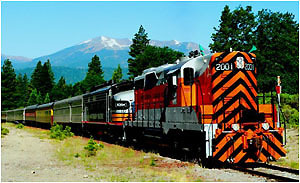 Our train then backed down to the grade crossing in Mount Shasta City. Great coversations were had with my now happy Second section early risers. The word to describe that show the McCloud 18 put on for us was "Fantastic!" At the grade crossing I detrained through the crowd trying to get back on our section of the train. I put my backpack on the chase bus and went back outside to photograph our Second Section. It then departed down the Union Pacific Interchange and we waited for the First Section to arrive. The time between allowed me time to visit with some other people. We all got on the Chase Bus and drove to Black Butte where a stop was made at a gas station for snacks and drinks for our bus ride to Klamath Falls. 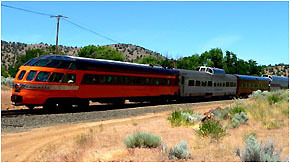 The bus then took us to the Black Butte grade crossing for our first shot of our Trains Unlimited Special. It was already getting warm out this morning so we all took refuge in the shade of the Black Butte Water Tower. 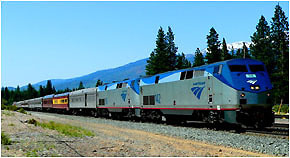 Our group heard an Amtrak horn and sure enough it was the Coast Starlight running over four hours late. We returned to waiting and heard over the scanner that the SP 6403 was having brake valve problems and would be removed from our train. This was not happy news to all the group standing in the shade at Black Butte. 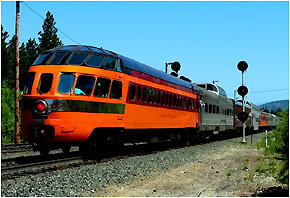 I finally said, "Think of it as a rainbow era Amtrak train with those engines being phototypes built in 1971 but wouldn't be mass produced for twenty five more years. Don't forget what's on the rear of the train." That got a few laughs as we heard a horn from the other way. NOTE: IT COST $32,000 TO HAVE THE F UNIT TUNED UP, REPAINTED IN SP BLACK WIDOW AND REQUIRED SPARK ARRESTORS INSTALLED WHICH IS NOW NEEDED FOR ANY SUMMER TIME OPERATIONS IN A NATIONAL FOREST. HUMM, ONLY GOT ONE DAY USE FROM THE F.
Another Amtrak horn and around the corner came our Trains Unlimited Special running at track speed by our photo lines. We returned to the bus and the chase was on. 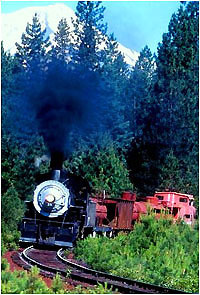 Driving down US Highway 97 we spotted the train as it was heading for the Hotlum Trestle. Our bus passengers were trying to get that picture of our train crossing it but the topography along the highway wouldn't allow it. We made our way passing Grass Lake Summit to our next photo location. 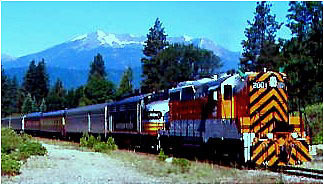 A UP freight came to a stop to wait at Grass Lake. We reboarded the bus and passed the train at Cougar and while the train took the long way through Bray and Kegg we went the short highway route to Mt Hebron. There we looked at photo locations but didn't like any so we moved north. Our next stop was at the Oregon Border but Chris Skow didn't like this location so we moved on to a grade crossing just shy of Worden. 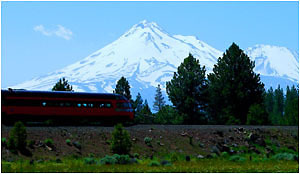 Here I got up on a hill across the tracks that gave me a view with Mt Shasta in my picture. It didn't take long for our Trains Unlimited Special to arrive at this scene and at track speed he was gone and out of sight in just a minute. We reboarded the bus to head to Klamath Falls. I was glad I did the bus as I finally got some pictures on the ground on the Shasta Route. 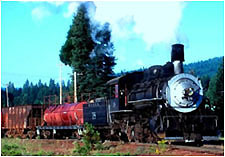 Coming into Klamath Falls we passed the Southern Pacific 2-8-0 2579 built by Baldwin in 1906 on display in Veteran Park. The Chase Bus arrived at the Amtrak Station seconds before our Trains Unlimited Special arrived. We all boarded and after that great "Chase Bus" I set up my table in the Wisconsin Valley before heading to the Pony Express for our trip north to Eugene. 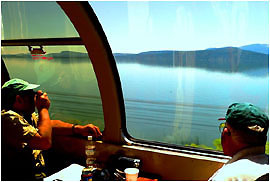 Our Trains Unlimited special left Klamath Falls at 2:00 PM and once we passed Wocus we started our run along Upper Klamath Lake. 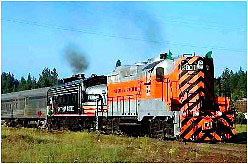 We continued north to Chemult where the BNSF Inside Gateway takes off from the Shasta Route. We started our westward climb up the grade to the tunnel at Cascade Summit. 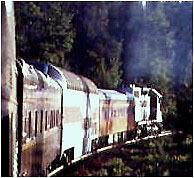 The Trains Unlimited Special had no problem climbing the grade passing through Glichrist Jct, Mowich and Crecent Lake. 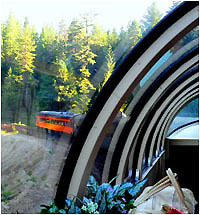 At Cascade Summit siding we are almost done with the climb to the summit tunnel. We went through the tunnel to start the incredible descent down the steep west side grade. 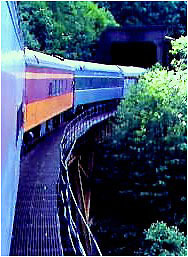 The train passed Abernethy before the real fun began with all the tunnels, snowsheds and bridges. 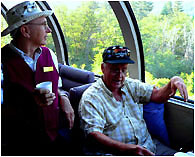 At Fields we met the UP 5424 West before we entered a 180 degree tunnel that would reverse our diection so we would head east down the middle level through tunnels to Wicopee. It would take another tunnel before we could reverse our directions west again. We ran across the Salt Creek Bridge to head back west running down through Heather and McCredie Springs. We came out of a tunnel and there was Rooster Rock. The descent continued through Proyer and on into Oakridge where we came to a stop for an Amtrak crew change. Once that was completed we continued on our way through a tunnel and across a creek. I have never seen Lookout Reservoir this full in any of my travels on this route. About fifty minutes later we pulled into a siding in Springfield to let Amtrak southbound Coast Starlight to pass about two hours late. The UP trackwork window north of Eugene not being opened until 5:30 PM was the sole cause of its delay. 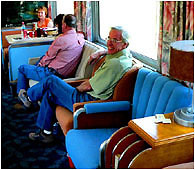 We finally approached Eugene where box dinners would be brought onboard the train. After an extened stay in Eugene we finally departed with very little light left in our day at 8:27 PM. We ran to the switch of the Central Oregon and Pacific Railroad and stopped before we entered their trackage and to start my first new mileage on the trip. The Willamette Pacific with the Southern Pacific backing was built starting at Eugene to Transfer getting to there on September 13th, 1913. Another company, the Terminal Railway had built 1.6 miles of track in Marshfield later known as Coos Bay in 1913 before being sold to the Willamette Pacific. The tracks were built west from Transfer to Walton April 16th, 1914; to Nekema September 20th, 1914; and to Mapleton on November 1st, 1914. 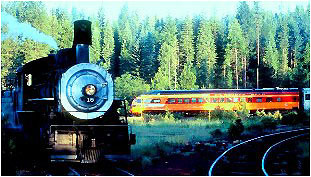 On July 1st, 1915 the Willamette Pacific was officially sold to the Southern Pacific. On August 1st, 1915 the line was opened to Cushmen and by April 5th, 1916 the track reached Gardiner. Meanwhile the line from Marshfield to Reedsport opened on April 5th, 1916. 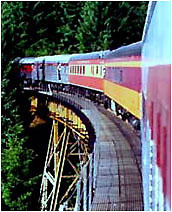 There was now only a 1.6 mile gap between the two ends of the line and that was due to the Umpqua River crossing. Ferry service was provided across the river until the Unpqua River Bridge was completed in early August of 1916. 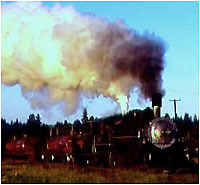 The first through train rolled from Eugene to Marshfield on August 24th, 1916. With the line completed passenger service took off. The Depression cut it back to one train a day nicknamed the Owl for its overnight schedule. In 1953, the Owl made its final run. 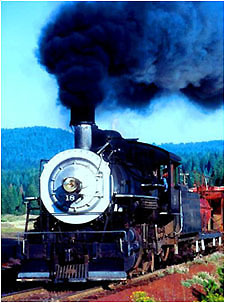 The railroad was then all freight until the end of Southern Pacific ownership. 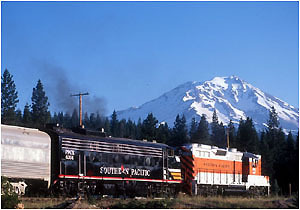 The SP sold the line to Rail Tex on December 31, 1994 and named it Central Oregon & Pacific Railroad, Inc. 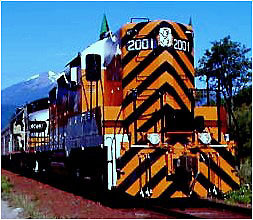 In 2002, Rail America acquired control of the Central Oregon & Pacific Railroad. 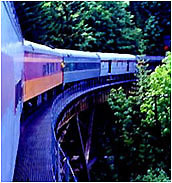 Traffic for this railroad is primarily forest products, chemicals, steel and LPG. 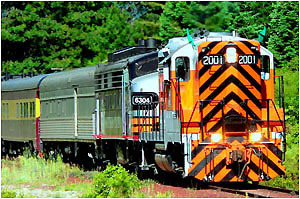 NOTE: TRAINS UNLIMITED, TOURS IS PLANNING A ONE WEEK EXCURSION OVER THE ENTIRE CENTRAL OREGON & PACIFIC SYSTEM INCLUDING THE MAINLINE AND THE COOS BAY BRANCH IN AUGUST 2006. Cascade Talgo 507 ran by us heading to its finally station stop of Eugene. Our crew threw another switch and we headed west at yard speed crossing the old Oregon Electric and headed out of Eugene. At a lumber mill we left UP controlled track and our speed increased as the sun set and we headed towards the Coast Range in twilight. It became to dark for pictures so Bart Jennings and I enjoyed the large open doors of the Pony Express. 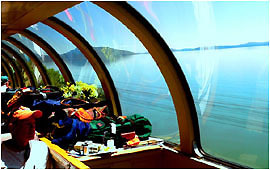 We rolled across a pair of curved trestles and through the Summit Tunnel 4 of the Coast Range. Bart recorded the mileage and time we passed each milepost then he figures out our speed. I just enjoyed the ride in the fresh air and the conversations with my other passengers as well as Stan Garner the car owner. We twisted and turned as we rolled along Wildcat Creek which we followed to the junction of the Siuslaw River. 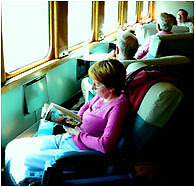 Lights from places like Richardson, Rainrock and Mapleton were passed during this nightly journey. I went back to the Wisconsin Valley to rest and to collect my stuff for my night's stay in Reedsport. Later I returned to the Pony Express as we closed in on Beck. Within a mile thanks to Bart's great information, I returned to get my luggage and prepare to detrain at Beck which we arrived at 12:15 AM July 4th, 2005. I have gotten off of hundreds of trains all over North America but never in complete darkness. It was a case of not even knowing what I was walking on. I headed forward along the train towards some light that were the buses to take us to our hotels. My ticket had my hotel number on it so I had to find the bus with that number. The first bus was one off. The next one wasn't even close. After visiting every other bus of course the last bus I found was mine. After pick up times where given, we drove forty-five minutes south to the town of Reedsport and the Anchor Bay Inn. I was second in line and told to find my name on the list. Mine as well as four other people's names weren't on the list and the owner said we had no more rooms. I went back to the bus and my driver told me she knew a place in Coos Bay that she could get me into. 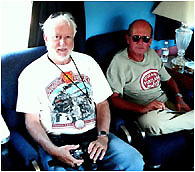 We were leaving when Chris Parker came out to the bus and told me his roomette was here and I could share his room. There were six other no shows so everyone got a room at the Anchor Bay Inn. Chris and I called it a night once we got into the room. We were the lucky ones! Meanwhile back at the Best Western in Florence the bus arrived and the passengers went in to get their rooms. Since they were so late, the Best Western had given all their rooms away. 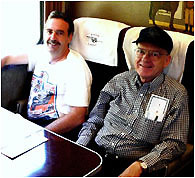 Bob Riskie had booked on his own and guaranteed it with a credit card but thinks he was with the Trains Unlimited Trip they cancelled his as well. They all got back on the bus and were taken back to the train at 3:00 AM. 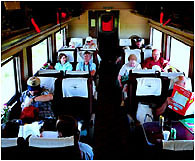 With no sleeping car rooms available, they all went into the coach to sleep the rest of the night in coach seats. Bob knowing that these seats could be turned did just that, and soon everyone was turning the seats. 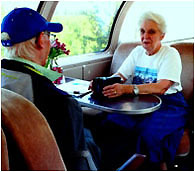 Passengers were given pillows and blankets for their night stay on the train. In the morning, they we told to get on a bus and go to Florence. They all elected to stay on the train. 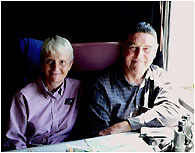 Later, the train was taken to Mapleton to be watered and they all went to lunch. That afternoon they would all be on our train at our next photo event. NOTE: THE BEST WESTERN IN FLORENCE NOT ONLY HAD A SIGNED CONTRACT TO HOLD ALL ROOMS FOR TUT PASSENGERS BUT THEY ALSO HAD A TUT CREDIT CARD ON FILE TO GUARANTEE ALL ROOMS, YET STILL GAVE THE ROOMS AWAY EARLIER IN THE EVENING. TWO WEEK PRIOR THE SALES MANAGER OF BEST WESTERN HAD TOLD CHRIS SKOW THAT ALL ROOMS WOULD BE HELD REGARDLESS OF HOW LATE THE TRAIN WAS. ALSO SEVERAL OTHER LOCAL HOTELS GAVE AWAY A FEW ROOMS TO OTHER PEOPLE EARLIER IN THE EVENING AFTER THEY TOLD TUT THAT ALL ROOMS WOULD BE HELD ALL NIGHT FOR THE GROUP. THESE HOTELS NOW CLAIM THAT THEY DOUBLE BOOKED A NUMBER OF ROOMS BY MISTAKE. Visits Since July 31, 2005.